Researchers: Freysteinn Sigmundsson et al., Nordic Volcanological Center, Institute of Earth Sciences, University of Iceland, IS-101 Reykjavık, Iceland. Intrusive unrest at Bárðarbunga Volcano in Iceland from August to September of 2014 shows segmented lateral dike growth along a divergent plate boundary. Seismic, geodetic, satellite imagery and field observations provide unprecedented details about the volcanic system. The growth of the dike explains how vertically rising magma is redistributed laterally over the flanks of the volcano, creating new crust where the tectonic plates separate. Iceland sits atop the mid-Atlantic rift, a divergent plate boundary between North America and Europe. Divergent plate boundaries typically have magma upwelling at the center of the spreading rift that forms new crust at the surface. Many of these boundaries are along mid-ocean ridges, where deep sea-floor observations are difficult and rare. Iceland and the Afar region of Ethiopia are two prototypical examples of divergent plate boundaries on land where observations of tectonic processes are possible. Bárðarbunga is a subglacial basaltic volcano located in the northwestern corner of the Vatnajökull ice cap. 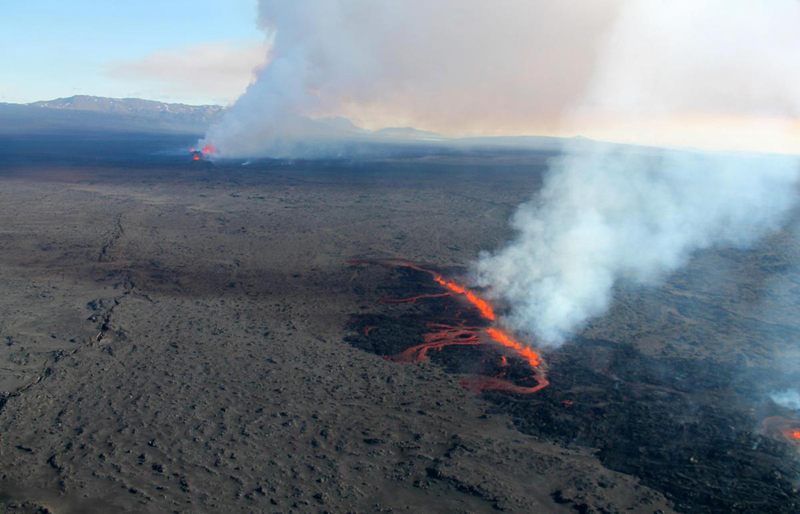 The volcanic system is monitored with seismometers, GPS stations, satellite radar images, and field observations. Using this fleet of excellent tools, the researchers tracked dike growth over a distance of 45 kilometers for 14 days during a period of volcanic unrest. Observations and modeling show that the dike grew at a variable rate in about 8 discrete segments via vertical intrusion of hot magma. The first segment starts at the edge of the caldera and propagates down the volcano’s flank, following the topography and the path of least resistance to the southeast. Then the second segment propagates to the northwest, changing direction by almost 90 degrees, to become aligned with the regional stress field of the diverging plate boundary. 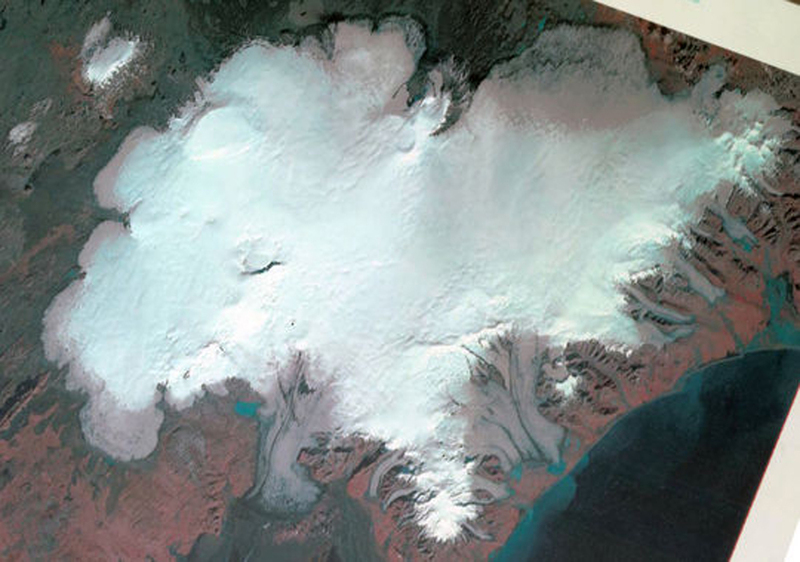 The other 6 segments continue to the north-northwest and become less influenced by topography as the volcanic system flattens out and the last segment emerges from beneath the ice cap. The segments propagated at different rates related to the amount of magma coming from the source, barriers to dike formation and changes in the stress regime. The last segment grew more slowly because the intrusive dike formation transitioned to an effusive surface fissure, relieving stress and providing a surface path for the magma. References: F. Sigmundsson et al., Segmented lateral dyke growth in a rifting event at Bardarbunga volcanic system, Iceland, v517, p 191-195, 8 January 2015, DOI: 10.1038/nature14111.